‘At times in the last few years,’ writes Duncan Green in his recent book, How Change Happens, ‘It has felt like something of a unified field theory of development is emerging.’ As Hegel reminded us, however, the owl of wisdom flies at dusk. As recently as early 2016 (which is about when he wrote these words), Green’s exuberant enthusiasm was shared by many of us. But a year, we now know, can be an eternity. How Change Happens synthesises a growing body of work that has aimed to move development scholarship and practice away from a preoccupation with so-called ‘best practice’ solutions. It captures well the sensibility of the new literature – a paradoxical combination of the enthusiasm of a breakthrough and the pragmatism of seasoned practitioners who have learned the limitations of overreach, often through bitter experience. But, as per Hegel, has our quest for useful insight reached its destination only to find that a new journey has begun – a different and more difficult journey than the one we had planned? 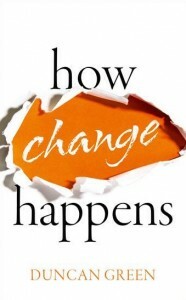 To link these, Green uses the metaphor of learning to ‘dance with the system’: ‘Understanding how the state in question evolved, how its decisions are made, how formal and informal power is distributed within it, and how distribution shifts over time – are essential tasks for any activist intent on making change happen’ (p.95). Insights along the lines of the above have led many of us to adopt a pragmatic approach to policymaking and implementation. In the spirit of working with the grain, of doing development differently, of problem-driven iterative adaptation, of politically smart, locally-led development (I list these buzzwords to signal who I mean in this essay when I speak of ‘we’), we focused on incremental change – pursuing quite modest gains to address very specific problems, and taking much of the prevailing configuration of power and institutions as given, as constraints on what is achievable. We justified incrementalism along these lines as a way of achieving development gains that were valuable in themselves – and, perhaps, might also be catalysts for a cascade of subsequent opportunities. And then, our pragmatism notwithstanding, we were mugged by reality. Suddenly and unexpectedly we find ourselves in a different world, the world of Donald Trump and Brexit, a world with democracy seemingly in retreat in many, many countries, a world where many of the foundational presumptions of the turn to pragmatism can no longer be taken for granted. Blindsided by change, we must ask: what did we get wrong in the way we danced with the system? This brings us to Green’s second group of analytical categories – state institutions, political parties, and norms. To begin with, state institutions – ‘the unsung heroes in the drama of development’, Green suggests – ‘(are) civil servants who soldier on despite the obstacles, because the stakes are so high – the institution they work within will shape the fates and futures of their peoples. That institution is the state’ (p.79). But the distinctive political, economic and social contexts within which state institutions are embedded constrain technocratic efforts to improve their performance. Many of us responded to this messy complexity by embracing the incremental, problem-driven approach described above. We lulled ourselves into taking a very constricted view of the power (for good and ill) of state institutions. Political parties were similarly neglected. As Green notes, ‘development thinkers pay political parties scant attention, and aid organizations tend to discount their importance. But, however dull … they are the clutch in the engine of politics, linking citizens to government … [and] carry the potential to achieve changes on an otherwise impossible scale’ (p.113). ‘India’s landmark 2005 National Rural Employee Guarantee Act (NREGA), which guarantees all citizens 100 days of unskilled employment per year on public works programmes, came about due to a combination of determined citizen activism and the fortunes of the Congress Party’ (p.125). By 2015, the NREGA gave employment to 122 million poor people across India (p. 126). (Read that last sentence twice!!!) Congress embraced the NREGA in 2004, at a time when the idea had been developed by civil society, and Congress ‘needed to rapidly cobble together a programme’ … and after ‘a determined campaign involving a fifty-day march across the country’s poorest districts, sit-in protests, direct contacts with politicians, and public hearings.’ If Congress had not won the 2004 elections, ‘the NREGA might well have joined the ranks of good, but failed, civil society initiatives’ (p.126). Our engagement with norms, the final analytical category in this group, was even more problematic. ‘Empathy is critical,’ Green notes, ‘if we are to build a bridge to people who see the world very differently from ourselves…’ (p.221). However, ‘we tend to default to working with “people like us”, when alliances with unusual suspects can be more effective.’ But focusing on norms isn’t only necessary as a way of being more effective in building progressive coalitions. As Green notes (in a moment of prescience, but which reads as something of an aside, out of step with the generally optimistic tone of the book), ‘the prospect of norm shifts can provoke a violent backlash’ (p. 61). Indeed, it can. Here, bringing the above pieces together, is what I think happened: While we were looking elsewhere, made complacent perhaps by our conviction that we were on the side of the justice towards which the moral universe was bending, we allowed ourselves to be trumped. We ignored the rising counter-reaction – the pushback of powerful (and monied!) interests, the resentment of those whose relative (though not necessarily absolute) standing was being undercut by a changing world, the growing resistance to a progressive (in our terms) change in norms. Crucially, we lost sight of the dynamics of power – specifically of the power of political parties to mobilise on the basis of ideas and incentives which we easily dismissed as reactionary. In so doing, we ceded the terrain of contestation over the largest political prize of all – control over state institutions – to actors and ideas which we presumed had been consigned to the dustbin of history. 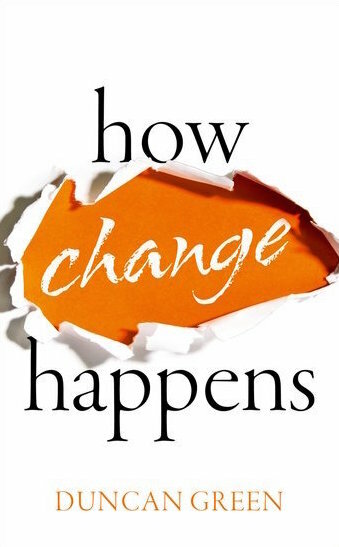 How Change Happens is stimulating and satisfying in the guidance it offers activists as to ‘how’ to pursue their agendas. But (as per the title) it has almost nothing to say about the ‘what’… (beyond its subtext, which signals clearly that it shares the values and aspirations of ‘people like us’). This focus on the ‘how’ with inattention to the ‘what’ is shared by much of the literature Green synthesises (my own work included). Indeed, for many of us, it has been a point of principle to redirect attention away from polarised debates about fanciful ends towards pragmatic exploration of means. But the times require heightened attention to the vision towards which our many localised efforts are directed; we need a new balance between the ‘what’ and the ‘how’. The broad contours of a progressive vision are clear: that we give our lives meaning by embracing inclusion, mutual solidarity, and stewardship as organising principles for a thriving society – thereby honouring the highest values inherited from our past, and acting on behalf of future, as well as current generations. Easily said, but evidently there is much work to be done to give content to inclusion and stewardship in a way that responds effectively to our brave new world of automation and globalisation, and that (as per Green’s admonition vis-à-vis norms) builds bridges to people who see the world very differently from ourselves. When I speak of a ‘new balance’, I am not suggesting abandoning what we have learned over the past decade about wrestling with the ‘how’ of development. Overcorrection – an endlessly swinging pendulum of fashionable ideas – has long been a chronic, debilitating disease of development theorising and practice. As I have explored elsewhere, the embrace of pragmatism was itself a response to a decade of democratic hubris. That hubris was disastrous. It set the stage for disappointment, as it became evident that grand promises could not be met. Worse, in failing from the first to acknowledge (and communicate effectively) the messy complexity of democratic governance, hubris laid the groundwork for an attack from the right. It allowed the critics of government to successfully depict the challenging realities of democratic governance as ‘proof’ of the futility of proactive public policies, of efforts to work collectively to build a better world. It is easy (and seductive) to preach Manichean visions of perfection and evil. If one has no real interest in governing effectively (or perhaps has a hidden interest in undermining and then dismantling prevailing patterns of public governance), then there is no reason to exercise restraint. (Of course, should one then find oneself in power – a la DT; the Republican Party; or the champions of Brexit – then the reality of false promises will become evident, hopefully to be followed by comeuppance and discrediting). But if the goal genuinely is to leverage collective endeavour and the public sphere as a way to build a better life for all, then the challenge is a more demanding one. We need to communicate two superficially contradictory ideas at the same time: that embracing a vision of inclusion and stewardship in a thriving society offers a pathway to a fulfilling life, and that the quest to realise that vision will be challenging, fraught with obstacles. In the recent past, we have done neither; we have neglected the ‘what’ in favour of the ‘how’. And our work on the ‘how’ has become so preoccupied with addressing very specific problems, that we ceded to ideologues of both the right and the left the terrain of discourse as to how the public sphere works; why; what are reasonable expectations; and how it should be engaged. A way to combine hope and pragmatism in a coherent vision is to underscore that, however challenging and fraught with obstacles, the quest itself can itself be a source of fulfilment. Doing our part. Not everything, but enough to inspire a sense of possibility, and thereby successfully pass the baton to the next generation. That, as per the wisdom of ancestors, “it is not for us to complete the task, but neither is it for us to desist from it”. This review was originally published on Brian’s blog, workingwiththegrain.com.